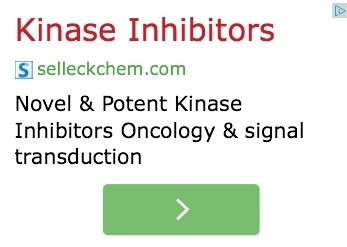 I don't know about you, but I've been seeing a lot of advertising on various websites (I think using Google ads, or whatever it's called) for the Texas-based biochemistry firm Selleckchem.com. I'm not really an ideal potential client for them; I confess I can't really understand their advertisements. Though one of them does feature a cute bunny rabbbit. I wonder what algorithm has decided that I am the sort of person who might ever purchase one of Selleckchem.com's products, let alone face an agonising choice between them and their competitors. Is Google's targeted advertising that poorly targeted? 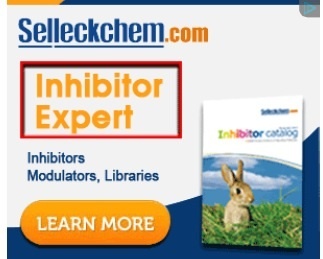 Or is it just that Selleckchem.com have more money than sense and have bought All The Ad Space to try and persuade people to buy their particular brand of inhibitor? Ah. AKT and mTOR are involved in apoptosis--programmed cell death that takes place during development (for example the eyes form under a flap of skin--cells in one line down the middle of that flap all die in unison, allowing the eyelids to separate so the young creature can open its eyes, that kind of thing.) Apoptosis is apparently also involved in cancer, so perhaps these are anti-cancer meds, or perhaps they are lab supplies intended for researchers studying apoptosis. But having to look things up suggests some sort of advertising failure. Failure to target the right crowd perhaps, or failure to be clear about what it is you offer. The question this raises in my mind is, why aren't you getting these ads rather than me, given that you're a bit closer to the topic than I am? I joined LJ so long ago it had no ads. When it grew ads there was an option to sign up for having ads on your account in exchange for some sort of improved package of options: I forget how it worked, exactly. I refused the upgrade every time the chance was offered. It's not that I don't see ads at all, but I only see them when I go to particular people's individual pages to reply to something they said. But yes, I would arguably be a better target audience, in that it is less work for me to understand what they offer. Though at the moment I neither have cancer nor work in a lab, and thus have no need for it anyway. Just to be clear - I'm not getting these ads on LJ either; I signed up for the full no-ads package when I had the chance. I am getting them more on newspaper sites, or Blogspot blogs, etc, which makes me think that Google is responsible. The GFRs are all growth factor receptors, so upregulation and dysregulation of those is important in cancer. Apoptosis is usually broken in cancer, otherwise the cells would react to the mutations causing uncontrolled cell division by dying. It looks as though they are trying to go in a bit further down the pathway than existing agents like everolimus, and they're probably marketing to folks doing in-vitro oncology studies. The ads strike me as pretty opaque, though, as I can't see any hint of what they are actually offering. The -imus drugs are all mtor inhibitors, the AZD and GSK will be in the AstraZeneca and GlaxoSmithKline pipelines but not far enough to have a name, not a clue about anything else. I think mtor is involved in angiogenesis as well as apoptosis, also important in cancer. I keep getting ads for online poker. I've never even looked at a poker website let alone joined one. That and ads for an MMOG called Eve Online which I've been playing since 2005. Not quite sure why they're advertising a game I already play but what do I know? 'Nother bio bod here. 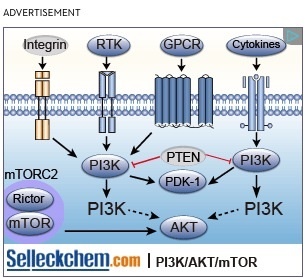 I suspect that they sell inhibitors to the kinase pathway in the first diagram. I don't suppose you've been lending your laptop to any roving biochemists. Other than that, it's inexplicably poor targeting of adverts. I'm a physics/imaging bod rather than a bio one, but I work in a cancer research institute where people talk about these pathways enough that I recognise them as being important in oncology and potential/current drug targets. I have never once seen an ad for this company, at work or out of it. I wonder what you did to point Google Ads to that? Have you ever looked at their site, or just seen ads? A couple of places (ilumi, Debenhams) if I look at something on their site it shows up in my Google ads for a week, annoying if I've gone to look at the dress a friend has just bought for their daughter, or if I bought two weeks worth of food while I was on the site. So many of your postings mention "Doctor this" and "Doctor that" --perhaps the robots have decided you are involved in the life sciences.